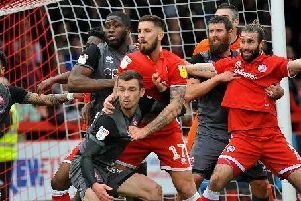 Crawley Town’s new head coach Gabriele Cioffi believes centre-back Bondz N’Gala can have a good future at the club after he signed a one-year deal. The former West Ham youth whose former clubs include Dagenham and Portsmouth, impressed the new boss having joined on a short term one-month contract at the end of August. The Reds boss has been impressed with the club’s most recent signing on the playing side. Cioffi said: “Bondz deserved the extension of the contract. “He showed something amazing because he completely missed pre-season training but played four games in a row and gave a good performance. “He showed heart, patience and intelligence because you have to manage your body. “He is not a butterfly - physically he is massive. Players like him are gold in our squad. Cioffi is happy with his backline and is delighted to have inherited such as strong trio of central defenders. He said: “We are lucky because we have three good centre-backs (N’Gala, Mark Connolly and Joe McNerney) and they are a good backbone and will challenge the opposition. “At the moment Bondz and Mark doing really well, as are all the squad. “Sooner or later will come the moment for Joe (McNerney) and I’m sure he will do very well.